Have you heard? 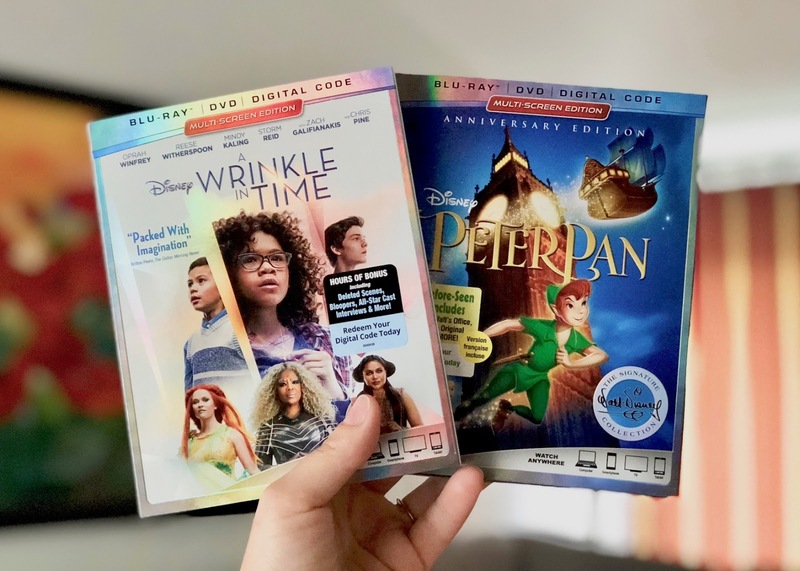 Disney has just released the Blu-ray and Digital versions of "A Wrinkle in Time". Fans of the movie can now enjoy hours of bonus video that include deleted scenes, bloopers, all-star cast interviews, music videos and more. And if that weren't exciting enough, Disney also released the 65th anniversary edition of an old classic - "Peter Pan". With summer vacation just around the corner, what better way to celebrate the end of another school year than with a family movie night featuring these two new releases. Read more about these popular Disney hits and enter for a chance to win a Blu-ray copy of both movies. Oprah Winfrey, Reese Witherspoon, Mindy Kaling and breakout star Storm Reid ­­take viewers on an extraordinary journey of self-discovery, then behind the scenes through exciting extras! Just in time for summer break, Disney’s “A Wrinkle in Time,” from acclaimed director Ava DuVernay, comes home May 29 on Digital HD and June 5 on Blu-ray™, DVD and On-Demand. The stunning story of an ordinary girl’s extraordinary adventure through time and space offers exhilarating entertainment and positive messages for the whole family—encouraging self-confidence, inclusion and pushing imagination to the next level. In celebration of its 65th anniversary, Disney's beloved flight of fantasy, "Peter Pan," joins the highly celebrated Walt Disney Signature Collection, landing in homes on Digital and Movies Anywhere on May 29 and on Blu-ray June 5. With a little faith, trust and pixie dust, every member of the family will let their imagination soar on this epic adventure to Never Land, sparkling with legendary animation, extraordinary music and both all-new and classic bonus features. Win Blu-ray Copies of Disney's A Wrinkle in Time and Peter Pan! 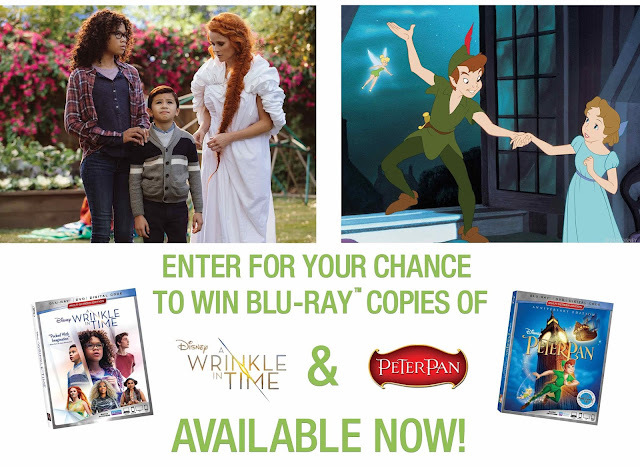 To win a Blu-ray copy of both Disney's A Wrinkle in Time and the 65th anniversary edition of Peter Pan, please complete the Rafflecopter form below. Open to residents of Canada only, excluding Quebec. Disclosure: I received product to facilitate this post. Any opinions contained therein are my own. This post contains affiliate links. I think Beauty & the Beast would be my favourite Disney movie - I love the music so much in that one. As for a favourite character, I have a soft spot for Lilo - there's just something about this kind hearted underdog that I love. My favourite Disney movie is Bambi. Still love Ariel and The Little Mermaid! It's like you're asking me to pick my favourite child! But I do get super excited for Tinkerbell, and I love Brave and Merida. My favourite movie is Beauty and the Beast! I love Belle and Merrida as they spirited woman who challenged the norm! Thanks for the chance to add Peter Pan to our Disney DVD collection! I have always loved Cinderella. The whole magic of it definitely swept me away as a little girl. My favorite movie is Beauty and the Beast. My favourite Disney movie is Mary Poppins. I love Anna & Elsa - so much like my 2 girls. Mickey Mouse is my favorite Disney character but Toy Story is my favorite Disney movie. My favourite Disney movie is Cinderella. My absolute favourite Disney movie is The Aristocats, followed closely by the Fox & the Hound! Robin Hood, Lady & the Tramp & Bambi are my other favs! My favorite 'classic' is Cinderella.. I love the story and I love that dreams can come true.. Recently I like the Toy Story series..
Cindrella is my favorite Disney movie. She gets her prince. I always loved Lady in Lady and the Tramp. It is a lovely classic Disney movie. I love The Lion King so much! A childhood fave is Fantasia. My favourite Disney character is Sully. My favourite Disney movie is Monsters,Inc. Sulley is my favourite character. My favorite Disney movie character is Ariel.